The latest issue of Applied Physics Letters carries news about a silicon transistor, designed by NTT Corp. (NTT) of Japan, that is switched on and off by the motion of an individual electron. The transistors have been tested at the National Institute of Standards and Technology (NIST) and the researchers say they will have application in low-power nano-electronics, particularly as next-generation integrated circuits for logic operations. Until now, this type of transistor – called a “single-electron tunneling” (SET) device – was typically made with a metal “wire” interrupted by insulating barriers that provided a narrow range of control over electron flow. But silicon devices overcome this limitation by having barriers that are electrically “tunable” over a wider operating range, offering finer, more flexible control of the transistor’s on/off function. Silicon-based devices also allow fabrication using standard semiconductor technology. The researchers say that this is the first reproducible and controllable silicon SET transistor design to have been reported. The new devices are based on the principle that as device sizes shrink to the nanometer range, the amount of energy required to move a single electron increases significantly. It is then possible to control individual electron motion and current flow by manipulating the voltage applied to barriers, or “gates,” in the electrical circuit. When the transistor is turned on, individual electrons file through the circuit, as opposed to thousands at a time in a conventional device. 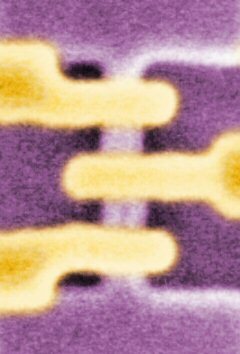 NIST/NTT made five uniform, working silicon transistors with tunable barriers. Each device consists of a silicon channel 360 nanometers (nm) long and 30 nm wide, with three gates crossing the channel. The gates have two levels; the upper level turns the current on and off, while the lower level controls electron flow in small local areas. The team was able to tune gate conductance properties over a wide range, by more than three orders of magnitude.